Kultklecks is looking forward to the cooperation with Global Healing and the Roatán Volunteer Pediatric Clinic in Honduras. The non-profit will paint an outdoor mural together with local residents at the General Hospital. Roatán is an island of the Islas de la Bahía. It is located approximately 35 miles off the North Coast of Honduras. 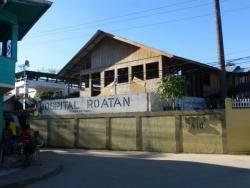 The exact population of Roatán can only be estimated, as it has grown significantly over the past few years. With more than 65,000 inhabitants the population has predominantly African-Caribbean and Latin American roots. The main target group of the project is children and youth, as they comprise a very large part of the population. Honduras is one of the poorest countries in Central America. More than half the population lives below the poverty line. Many families cannot afford art and cultural activities because of their financial situation. Kultklecks offers them the opportunity to discover their creativity and to actively shape their environment with its community mural program. The mural will be realized independently of the budget of the hospital. Kultklecks ensures that there are no costs for the clinic and the participants. A first meeting with the hospital staff was held in December last year to adapt the art concept on Honduras. Kultklecks will work very closely with the clinic to include the neighborhood in the design and implementation during the preparation phase. The goal of the mural project is to create creative impulses through the art involvement that last beyond the moment.